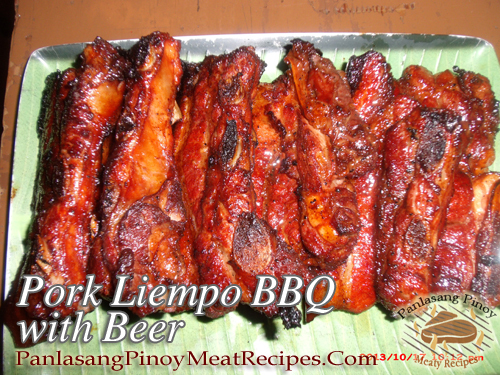 Barbecued Pork Liempo with Beer is almost the same as the pork barbecue in bamboo skewers that we all knew. 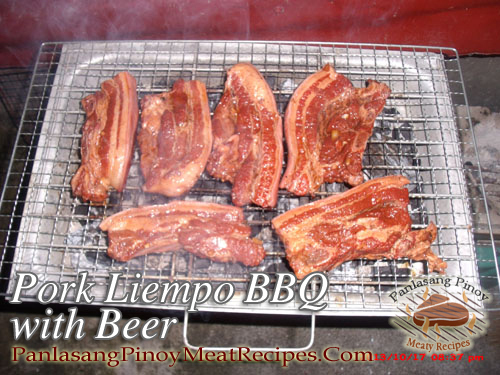 The only difference is the whole slices of pork belly is bigger and does not require bamboo skewers since a pair of tongs will do the job of turning the liempo while grilling and basting. In making barbecue marinade, I always add onion aside from the usual garlic because for me it taste better. I always think that garlic and onion are perfect combination whether it is sauteing or marinating. And the marinade on this recipe has beer to enhance the flavor and tenderize the meat. Also, with regards to barbecue marinade, when I’m feeling lazy I always resort to buying a commercial ready to use marinade. But I always experience burning the meat quickly and having a lot of burned marinade deposit on the grill. Probably the mixture contains too much sugar and the garlic and onion are pureed with the marinade. But I seldom experience it on a home made barbecue marinade like the recipe below. Wash in running water and clean the pork belly and slice it into ¾ inch thick. You can also ask the meat vendor to do that for you so the slices will be even and eliminate the extra work of slicing the meat. After washing the meat put it in the strainer to remove the water for at least 30 minutes. In a container (tupperware or zip bag will do well), put the pork belly and add in soy sauce, calamansi or lemon juice, black pepper, salt, onion, garlic, catsup beer and cookiing oil. Mix and mash the pork for a minute so that the marinade will be absorbed and let it marinade for 2 hours. 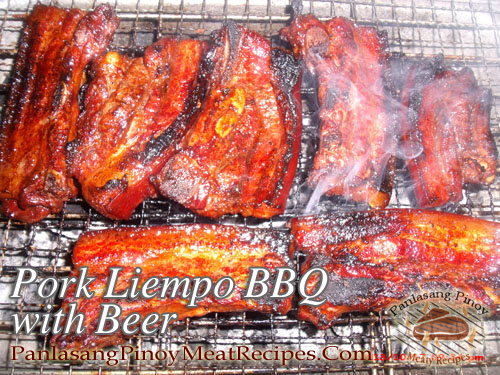 It is better to marinate it overnight so that the beer will tenderize the meat and the marinade will be absorbed by the meat much better than just marinating it for a few hours. When you are ready to grill the pork belly, prepare a charcoal grill and light up the charcoal. Distribute the live burning charcoal on the bottom of the grill so that the meat will be evenly cooked. Arrange the meat over the grill when the coals are already and prepare the marinade by pouring it on a small container like a plastic bowl and get a basting brush. Let it cook over the charcoal and baste it with the marinade using the basting brush. Turn the meat over using a pair of tongs and brush it again with the marinade to avoid burning and drying up. Repeat the process again until the pork belly is cooked. Transfer it to a serving plate and serve hot with vinegar and chili dip. They look so good, I will definitely try this recipe and I will let you know how it turns out!!! Hi Becca, I’m glad you like the recipe. what kin/brand of beer to be use? Hi Mylyn, Any ordinary beer can be used.